After putting it off for a few weeks, I finally mustered up the energy to watch the next three episodes of The Irregular at Magic High School. As you would remember from my first article on the series, I was really bored with the characters and story, and the show’s saving grace was pretty animation. Thankfully, things begin to change slightly after the first episode, but not as much as I hoped. Episode 2 picks up directly where Episode 1 ended, resolving the confrontation from the end of the episode. 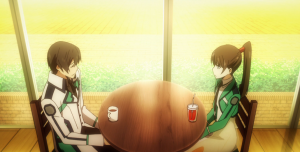 Nothing really happens in episode 2 except that Tatsuya and Miyuki are invited to join the student council as a Discipline Council Member and as the Secretary’s Assistant. There was a little controversy over Tatsuya being made a Student Council member due to his rank as a Course 2 student, or Weed. This conflict was actually interesting, except that the confrontation occurred at the very end of the episode and the duel that resulted was the most anticlimactic duel ever conceived. However, a point was proven: do not mess with Tatsuya, or else you will be wrecked! That point is taken to heart by the rest of the council, as in the next episode, he is made a member of the Disciplinary Council and initiated quickly by having to break up a fight between two clubs (Kendo and Kenjutsu) on who has access to the athletic facilities first. Story-wise, things didn’t really begin to catch my interest until the fourth episode when the leader of the Kendo team whom Tatsuya saved in the previous episode comes to thank him and give him a proposal: a way for Course 2 level students to earn respect and even the playing field between themselves and the Course 1 students. We also learn of the existence of an anti-magic group that has infiltrated the school and is planning to topple the school and magic users at large. As for our other protagonist, Miyuki, a single sentence is enough to explain her development since episode 1: she is jealous of any girl who gets close to her brother, whom she hero worships. The end. That’s all we get on her. Well, that and some really really awkward scenes between Miyuki and Tatsuya in which they keep the “more than just siblings” vibe alive with their incestuous banter and actions. Namely the scene where Miyuki asks Tatsuya to calibrate her Casting Assistance Device (CAD for short) for some new settings. She approaches him in a bathrobe, which she discards so he can scan her. This all seems like normal business for the task (I’m assuming the equipment needed maximum skin contact to do its thing). However as soon as the calibration is over, she latches on to Tatsuya, clad in her lingerie, and begins to flirt with him, accusing him of enjoying the company of his new female friends on the council and in classes more than she thinks he should. The banter ends in Miyuki getting extremely upset and Tatsuya getting knocked out. He wakes up, and she tells him her joke backfired and went too far. Sorry guys, that didn’t seem like much of a joke to me. I think we have this year’s Oreimo in the works – although I never saw Oreimo, so I’m not sure how accurate my comparison is so far. These type of incestuous interactions occur at least once an episode since the start, but normally with their friends present, so the idea of it being a joke works. However the scene previously described with no one else present leads me to think otherwise about how this relationship is supposed to be interpreted. Time will tell. For now, the story is still really slow moving; I feel like episodes 2 and 3 could have been paced better by being condensed into a single episode. However with the revelations in episode 4 and the story progression for Tatsuya, I am curious to see where this anime goes for now. Hopefully it improves more; at least I wasn’t fully-yawning-bored this time around.